On Saturday we returned our trusty Renault Megane Estate. Its 6 month lease was over and we couldn’t extend the term any further. It has been a fantastic car – reliable, spacious, comfortable, fast, economical, everything you could want. We returned it almost intact to the Renault Depot at Heathrow, just a couple of scrapes on one side resulting from trying to squeeze into a narrow driveway in Firenze. We will miss its luggage capacity, its start/stop button (just like an Aston Martin) and the way its side mirrors folded in when parked. We won’t miss its cable gear shift which meant that second and fourth seemed to be in the same place, or the cacophony of beeping that greeted any parking manoeuvre thanks to the front and rear parking sensors. So what car would you get as a replacement for a capacious, comfortable estate car? A Fiat 500 of course. The irony that all through Italy we drove French cars and now in the UK we drive the quintessential Italian car is not lost on Jean and I. The irony that we have an estate cars worth of luggage and the 500 is about the size of a roller-skate is also not lost on us. But it’s a Fiat and a really good one at that. It handles like a go-cart, it looks cute and it just makes you, well, smile. It’s ours for the next two weeks or until Mr Avis wants it back again. 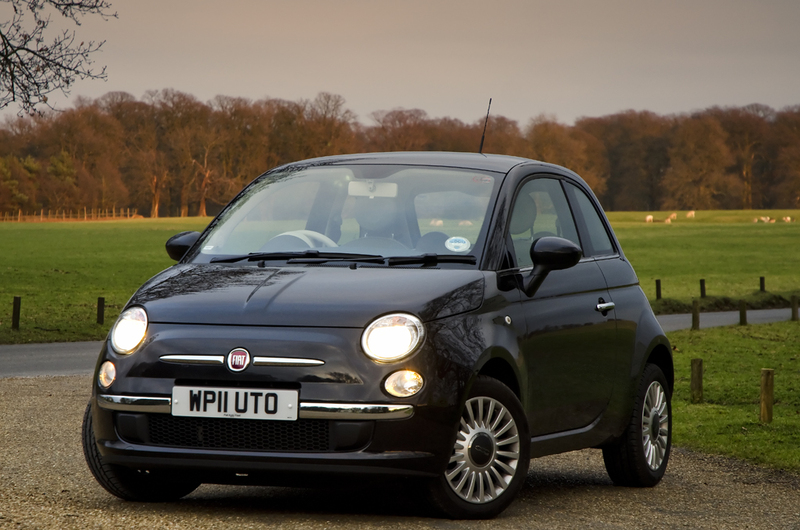 Note: The photo of our Fiat 500 was taken at Woburn Estate just before sunset. I quite like this shot. Last weekend we went to Ipswich. It meant a drive of about an hour and a half across England to the eastern coast – well almost the coast as Ipswich is located on the estuary of the River Orwell. Friends Sue and Ali are kiwis living and working in Ipswich. They came and stayed at Aspley Guise over Christmas and invited all the Aspley Guisers over for dinner and to stay the night. They have a penthouse apartment on the Ipswich waterfront. Like many towns located on the water, the area around the port has undergone a rebirth in the last few years with new apartment blocks being built and the original waterfront buildings being renovated. There is a feeling of Auckland when you walk along the Ipswich waterfront. Leisure craft are moored alongside and a plethora of cafes and bars exist near the water. On Saturday night Sue cooked a fine meal which, accompanied by a couple, a few, some, quite a lot of wine and beer, meant Sunday morning was a slow start. A walk along the waterfront was the ideal way to blow away the lingering hangovers. The past week has seen two celebrations at Aspley Guise. Gill had a birthday and, quite rightly, became queen for a day, and dear old Daisy the dog had a birthday – her 15th. Gill’s birthday involved champagne, a fantastic meal out at The Birch restaurant, presents from all over the world and a good old-fashioned hangover the next day. Daisy’s birthday involved a cake with candles, doggie treats, presents from all the doggie shops we know of and a hangover the next day due to a late night when the whole team were visiting friends in Ispwich. Daisy received a new winter coat from Jean and I which, unlike her current one, doesn’t need to removed by it pulling over her head (she bites anyone who tries to take off her current coat) and a new basket for her to sleep in from Gill, Andre, Josh and Jordan. In dog years Daisy is, depending on the formula used, either 90 and 105. Not a bad effort for an old lady and she continues to battle on despite her heart condition, poor vision and lack of hearing. The heart specialist in Italy described her as “il cane di miracolo” and she continues to defy the odds and lead a happy and relatively healthy life. The difference between now and a couple of years ago is that her pace of life is much slower. The girls usually have a haircut every 6 to 8 weeks. The last time they were groomed was in Siena at the end of October – 10 weeks ago. Jean had given them the occasional trim along the way but they were pretty shaggy so their first groom in the UK was quite extreme. Poppie survived relatively unscathed but poor old Daisy ended up with the Bichon equivalent of a number 1. The only redeeming feature is that her coat will grow back – and in an English winter quite quickly we hope. Calais is not the greatest place on earth. In fact it’s somewhere that you pass through rather than stay. We stayed for two nights on our trip north from Italy in December because the girls needed to pass a vet check before entering the UK – a worm tablet and a dose of Frontline, €110 for that, merci. We stayed in the old part of Calais and, as the weather was cold and wet, didn’t venture far from the hotel. On the first night we asked the hotel receptionist where we could eat. She recommended a bistro down the road so all four of us went out for dinner. A few metres down the road we found Au Vieux Fourneau. A small and quaint bistro exuding French charm and on a cold wet night it looked very welcoming. The service was that wonderfully aloof French style where you should feel grateful for being served – not a great start. But then there was the food. It was really good. I mean really good. To be honest it was not what we were expecting. We ordered from the set menu and received a complimentary “chef’s bite” to begin. Jean had a homemade terrine for her entree while I tried the fish pie. Mains were a Salmon Penne and a deconstructed Shepherds Pie. Desserts were the inevitable Creme Brulee and a very tasty Red Berry Crumble. None of these bland descriptions come close to doing the dishes justice. This was French cuisine to a very high standard. Washed down with a half bottle of red and half bottle of white, it made for a very pleasant evening. The girls behaved themselves sitting quietly under the table so all was well with the world. We were so impressed that we returned the next night and sampled more from the menu. The cost for this three course meal? Look at the pictures and let us know what you think.